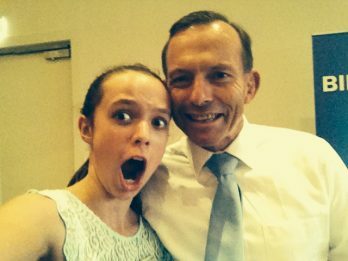 Three years ago, our 11 year old daughter was invited to have afternoon tea with the Prime Minister of Australia, Tony Abbott. One of our first reactions as a family, after agreeing that we would do everything possible for her to attend, was to agree to draw (for the children) and write (for hubby and I) a prophetic word each for him. It was just natural to think that way, almost ‘second nature’. Several weeks later, I was amazed at the number of Christians who had commented to me that they would never have thought to write or draw a prophetic word / picture for him. This shocked me. Why wouldn’t you take the opportunity in person to do that. We didn’t include any Christian language. We were encouraging and strengthening in what we wrote and drew. We purely asked God, “how do you see him and what would you like to say to him?” and then we listened for God’s reply. Reflecting on this later, I realised that several years earlier, we would never have thought to do it either. The journey we have been on over these last seven years has prepared us for this. We have specifically tried to take every opportunity that we can to write, draw, and speak prophetic words over people. We have incorporated it into our daily lives so that it is part of us. We have grown considerably in our gifting because we have practiced. I encourage you to practice and take every opportunity you can. We have stuck to the basics of it being encouraging, edifying (strengthening) and comforting. We have tried not to use Christian language but begin by saying, “I sense that…” and not using “God says…”. We have never spoken or drawn negative things. If we ever did get anything negative, we would change it to the opposite and speak the positive, thereby giving life to what we said and to the other person. Basically, there are four steps to take initially to grow in the prophetic. The more you practice something, the better you get at doing that activity. I have found that a hugely significant way to grow in the prophetic is to get closer to God. To become more intimate with Father God, Holy Spirit and Jesus. The more intimate we become with all three, the more we recognise the subtleties of what they say and do and who they are. I encourage you to go on a journey of discovery with God and yourself. Look at who God says you are. Discover your true identity. Find out how you are known in Heaven. Explore the good, the bad and the ugly about yourself. God is a safe person and place. Be truly vulnerable with God and ask Him to reveal to you those areas you need to grow in eg any fears, shame, guilt etc. Spend time with God immersing yourself in being completely vulnerable with him and discovering what He thinks of you. As you uncover your true identity and live that out in its purest form, the more likely you are to hear God and operate in an intimate manner with God. Thus, your prophetic skills of hearing and seeing from God will grow and you will want to release what God is sharing with you to others. Fourth, take responsibility for your own growth. You are responsible for your own growth. Do not expect anyone else to take this responsibility from you. Find prophetic people and ask them to mentor you. Keep a journal outlining the promptings you feel from God and what you have done as a result and the outcome (if it was apparent). Ask a friend if you can record a prophecy you speak over them so as to listen to it back and hear what you say. Sometimes we can be shocked by how often we mumble or keep repeating ourselves. Ask friends if you can ‘practice’ on them. Find someone to have fun with on this journey and be able to spur each other on in your prophetic growth. When you are intentional about growing in the prophetic and taking risks, you will see a huge improvement in your ability to give prophetic words and the depth of those words. 1. Children / Families Activation: Place an assortment of Lego on the table and ask everyone to make something from God for the person on their left out of Lego. Set a time limit. At the end, encourage everyone to share what they made and why. 2. Group Activation: Have enough envelopes and slips of paper for each person in the group. Ask people to write their own name on a slip of paper, fold the paper so the name can’t be seen and put it in the envelope and seal the envelope. Gather all the envelopes and shuffle them. Pass the envelopes out so that every person has an envelope. Ask people to write on the outside of the envelope a prophetic word for the person’s name inside it. Set a time limit of seven minutes maximum. Ask people to then open the envelope and pass to the person whose name is on the inside. Let that person read what is written on the envelope for them. 3. Beginner Activation: Find a strong fragrance and take your time inhaling the aroma. Ask God to reveal to you what He wants to communicate to you through that fragrance. 4. Intermediate Activation: Ask God to speak to you through an advertising sign. Ask God to also highlight a person or situation that it speaks into. When you realise what that is, communicate the prophetic word to that person using the advertising sign as a base or springboard for your prophetic word. 5. Advanced Activation: Find a house or business for sale that has been for sale for a lengthy time and doesn’t seem to be selling. Spend time with God asking Him what to pray and then prophesy over that house/business. Observe over the next few weeks to see if what you prophesied makes a difference. Thank you Jill. I hope you enjoy trying out some of the suggestions and activations and that you find them useful for your growth in the prophetic. I certainly appreciate your thoroughness and helpfulness in these articles! God bless you!